One is continually surprised by how many new plants are coming into bloom: in high meadows, along wetlands, sage flats, and roadside edges. Many of them are “composites” or members of the aster, daisy, or sunflower family: Asteraceae. 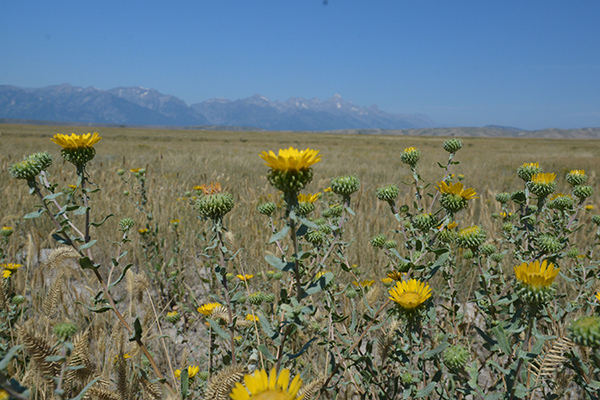 Many are yellow, others- mostly “asters”- are blue, and some you may not know are in bloom at all: sagebrushes. 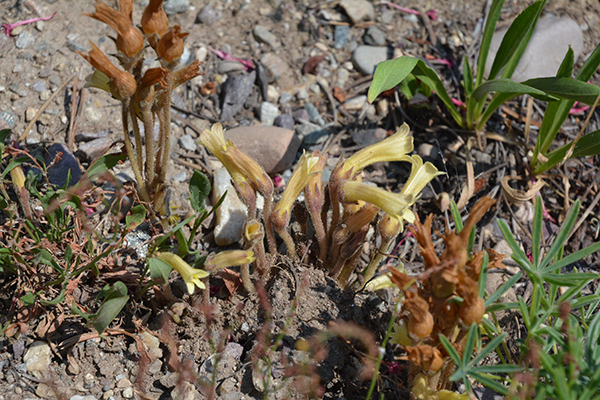 A few other unrelated odd species pop up as well, such as elegant gentians and inelegant broomrape. Below are a few wildflowers that you might notice on your hikes and drives around the valley. Plus a quiz plant! 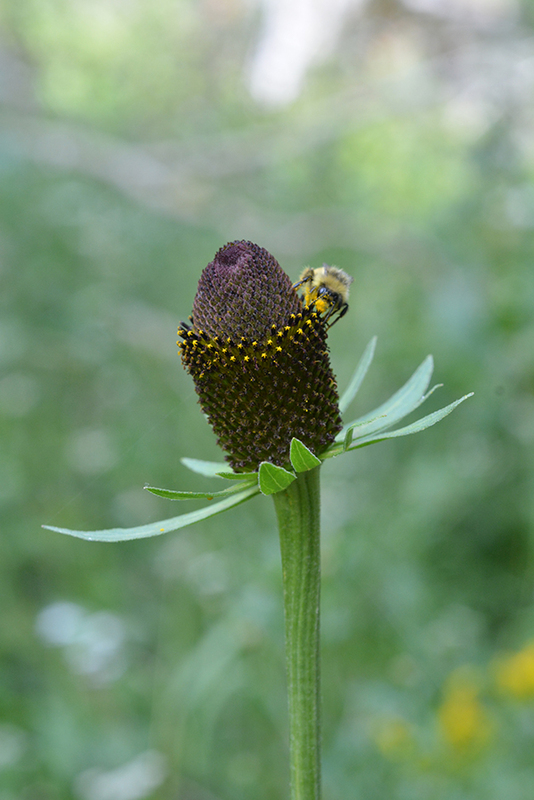 Western Coneflower– Rudbeckia occidentalis – The purplish brown cone-shaped receptacle never looks quite in bloom until you notice the bees working them over. Western Coneflower – tiny flowers attract bee pollinators. 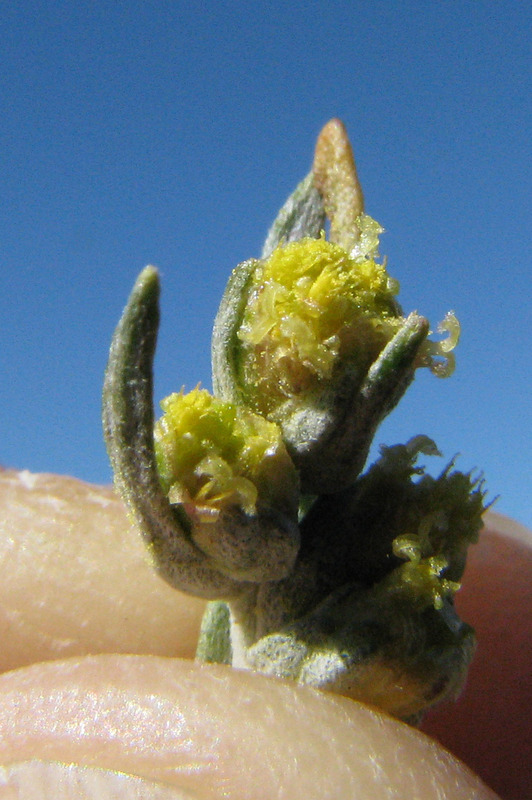 Looking closely, you may see a row or two of tiny “disc” flowers with pollen being pushed up. They start blooming at the base and gradually continue row by row up to the tip. These 5’ plants with large 6-8”, rough, oval leaves are found in moist meadows. Curly Cup Gumweed – Grindelia squarrosa – A relative newcomer to Jackson Hole from its surrounding native range, it has now migrated in along dry roadside edges, mostly in the south end of the valley. Look carefully at the bases of each head to see the distinctive bracts curling back from the center. 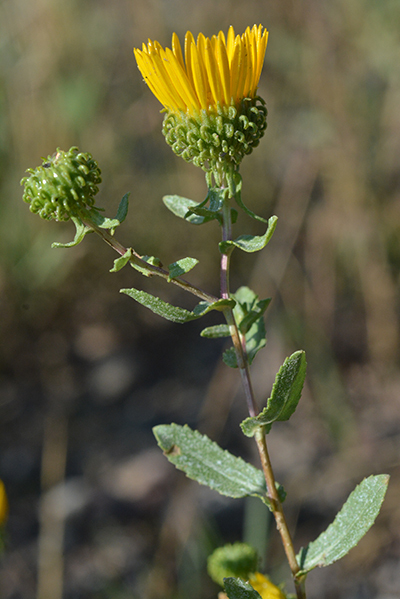 The curly resinous bracts give the plant its name: Curly Cup Gumweed. These one-of-a kind heads are very resinous: sticky and pungent. The 1” leaves are toothed, and often clasp the stems. Sage grouse chicks 5-8 weeks old relish gumweed in Montana, and maybe here as well? Showy Goldeneye – Viguiria multiflora – Also found along roadsides and trails in the sun to partial shade, these cheerful 1-3’ high plants catch your eye. Flowers are borne loosely atop wiry stems. Showy Goldeneye catches attention along roadsides and trails with its cheerful flowers and tidy opposite leaves. The 2”-3” long, neat, oval leaves with pinnate veins are held opposite each other. 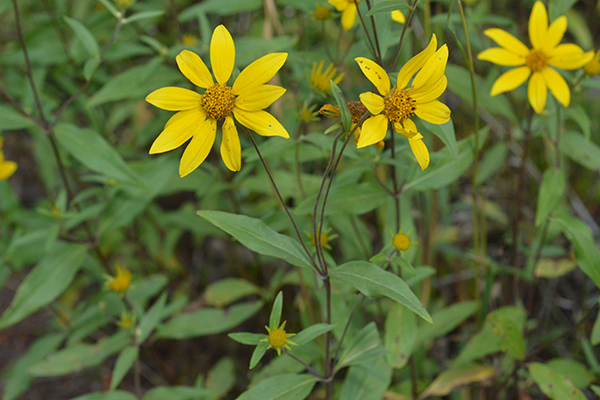 The flower heads are surrounded by tidy rounded bracts, and you may notice the 8-10, broad, petal-like ray flowers are slightly darker toward the center. In bee vision, this slight change in hue creates a bull’s-eye pattern. Pollinators have a perfect landing pad from which to gather nectar and honey. Parry’s or Rayless Arnica is the odd-ball of the popular Arnica genus. It has no sunny ray flowers, only disc flowers. Parry’s/Rayless Arnica – Arnica parryi – This odd-ball arnica grows 1-2’ tall on the edges of high meadows and coniferous forests. Unlike its sunflower-like cousins, this species has rusty yellow flower heads with disc flowers only bunched together in 1” heads. However, the bracts beneath are all the same size; the leaves, although small, are opposite each other in 2-4 pairs on the stem; and the seeds will have fluffy parachutes (pappus)—all typical of Arnica. This plant is sticky hairy. 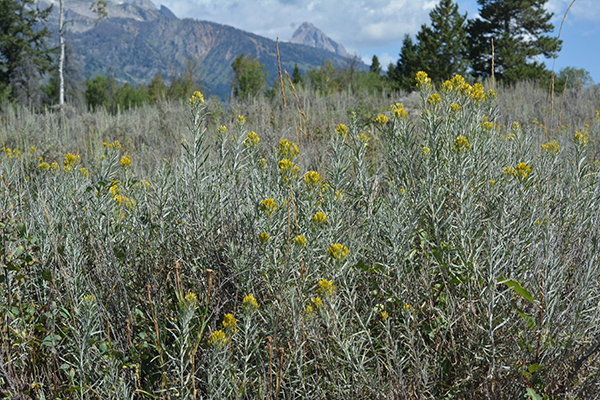 Several yellow composite shrubs brighten sageflats. This is Rubber Rabbitbrush – Chrysothamnus nauseosus. Three sunny composite shrubs: Three shrubs add yellow splashes and swaths of color along roadsides, sage flats, and disturbed, dry habitats. Their genus names have been debated for years as the scientists sort out who is related to whom. Each species has several varieties, further indicating a range of often confusing characteristics. Rubber Rabbitbrush – Ericameria/Chrysothamnus nauseosa – This 3-4-foot shrub adds panache to the grey-green hues of sagebrush habitats. The broad, rounded crown is colored by many narrow flower-heads clustered together on the ends of upright woody branches. The very narrow long leaves (1/8” wide to 4+” long) stick out from a grayish, furry stems (tomentose). The twigs have a milky latex sap which gives it its name. Rubber Rabbitbrush has dense felt-like gray hairs on the stem and long, flattish leaves, as well as bright yellow flowers. Look for butterflies nectaring on these profuse flower heads. Douglas Rabbitbrush – Chrysothamnus visidiflorus – Similar at first glance to Rubber Rabbitbrush and sometimes placed in the same genus, this shrub differs in being generally shorter 1-2’ shrubs; green, not gray, hairy young stems; and 2-3” oblong, usually twisted leaves which are a bit sticky (viscid). 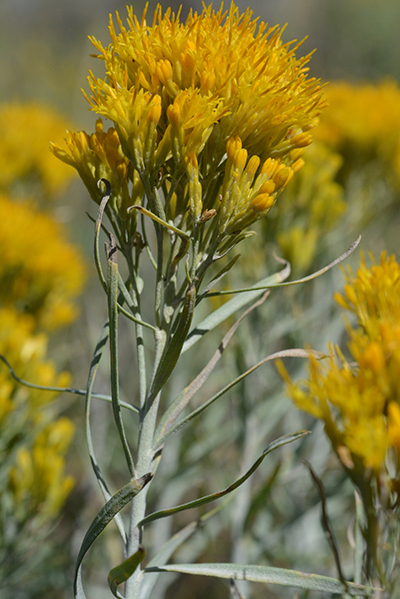 Douglas Rabbitbrush has bunches of yellow flowers at the ends of brittle, greenish stems. 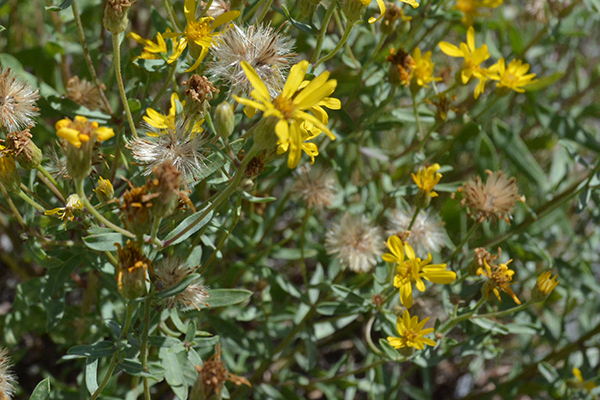 The leaves of Douglas Rabbitbrush are usually twisted, and the stems are hairy, but not felt-like. Hairy Golden Aster – Heterotheca/Haplopappus/Chrysopsis villosa – The lowest growing of the three late-summer blooming shrubs, this somewhat woody species grows 6-12 ” in dry disturbed sites and road edges, often with blue Pacific aster. The leaves are hairy and slightly wavy, only about ½-1” long. The ½” flowers are a soft yellow. This genus remains a muddle taxonomically. The genus for Hairy Golden Aster has been in dispute. Two rows of pappus hairs is one clue. Yikes! Blue to White Aster-like flowers: Taxonomically Aster is no longer Aster as scientists around the world have shared and refined their knowledge of this confusing group of plants. The Europeans claim the old Aster name. 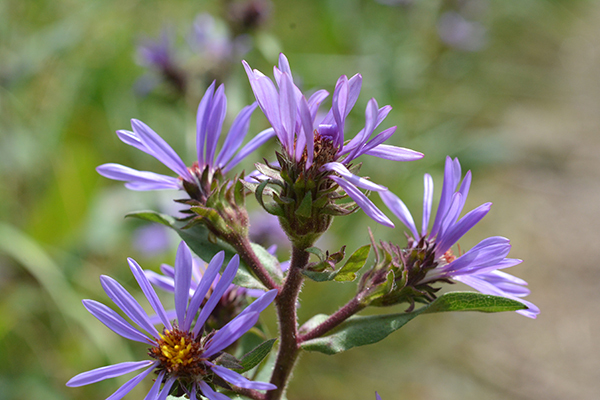 Our genus “Aster” is split now into several new groups with hard to spell and pronounce names. Below are the common names (still aster) listed with the new botanical names. Differences are based on growing habit, flower-head bracts, obscure pappus hairs, and invisible DNA. Luckily, some kinds are quite easy to tell apart once you look. 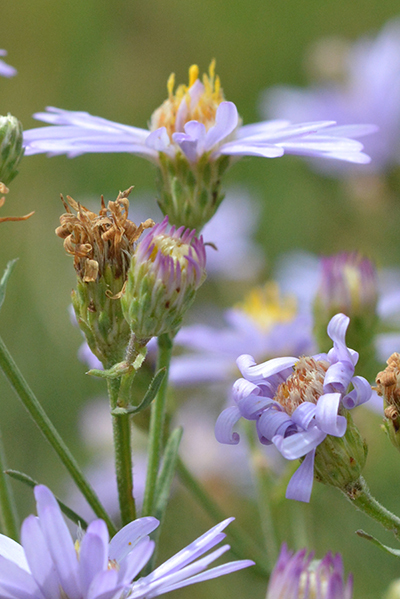 Pollinators of aster flowers are typically bees and butterflies. Thickstem Aster – Eurybia integrifolia – Common in meadows, these 1.5-2’ plants have thick, often purplish-red stems coated with sticky hairs. Stems branch mostly near the top, holding out deep-violet flower clusters. Each flower-head has loose, leaf-like bracts that are also very sticky. The glandular hairs form a gluey forest that deters small insects from creeping up the stems to lay their eggs in the larder of fattening seeds. The oval leaves clasp the upper stem, the lower leaves can be petioled. The stems of Thickstem Aster are not only thick, but also sticky. A forest of glandular hairs deters crawling insects from laying eggs in the developing seeds heads. Chaffy Asters – Eucephalus sp. 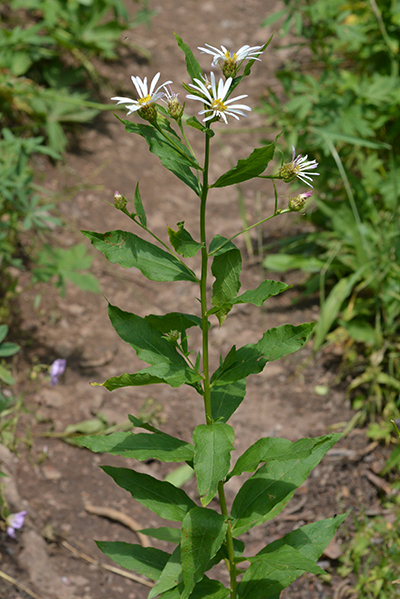 The three Wyoming species of Chaffy Aster typically sport a few upright stems which are trimmed bottom to top with many alternating, oval to elongate leaves. The plants branch like candle-arbors near the top where a few sparse flowers are arrayed. Flower-heads have relatively few (6-12) showy ray flowers. The receptacle is elongate, covered with 3 rows of broad, dry (chaffy), triangular bracts arranged like shingles on a roof. These three species are often found growing among one another. Nuttall Aster –Eucephalus elegans (Aster pereglans) –This species is the shortest and most elegant of the three, averaging 1-1.5’ or so. The flower-heads display 5-7 violet-purple ray flowers. 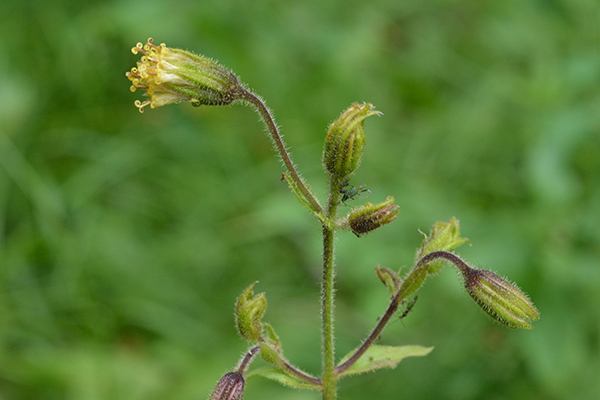 The tightly arranged bracts are hairy, especially around the edges, and are often traced with purple. The oblong 2” leaves are neatly arranged up the stem. Flowers of Nuttall’s Aster exhibit fine features of the genus: the broad bracts in several rows and only a few ray flowers. 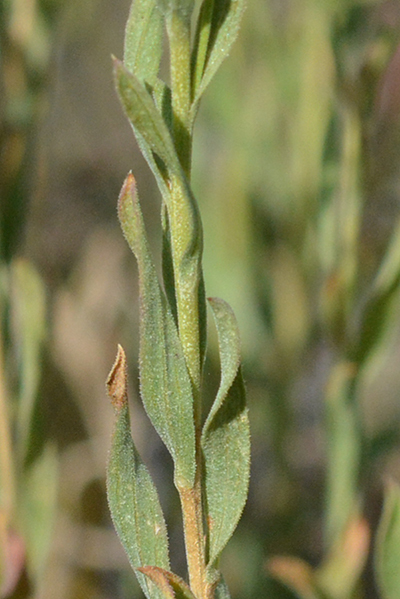 The leaves of Nuttall’s Aster, as with other members of the genus, alternate up the whole stem, gradually becoming smaller. 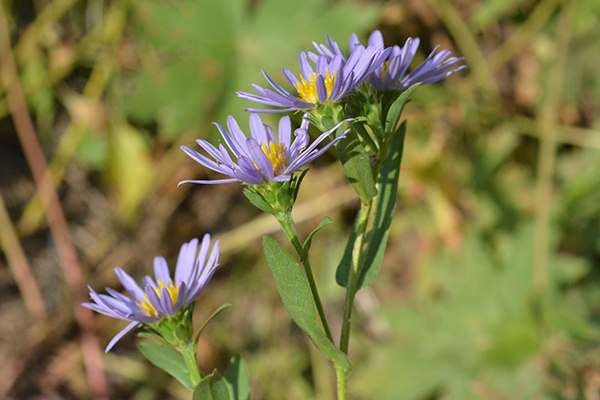 Engelmann’s Aster – Eucephalus engelmannii –This aster stands up to 3-5’ tall and tends to lean out from the shade of forest edges or above other robust meadow plants. The large bright white, slightly ragged flower-heads cluster near the tips of the sparse branches. The straight stems are covered with many 3-4” oblong leaves. Engelmann’s Aster is the largest of the three chaffy asters. 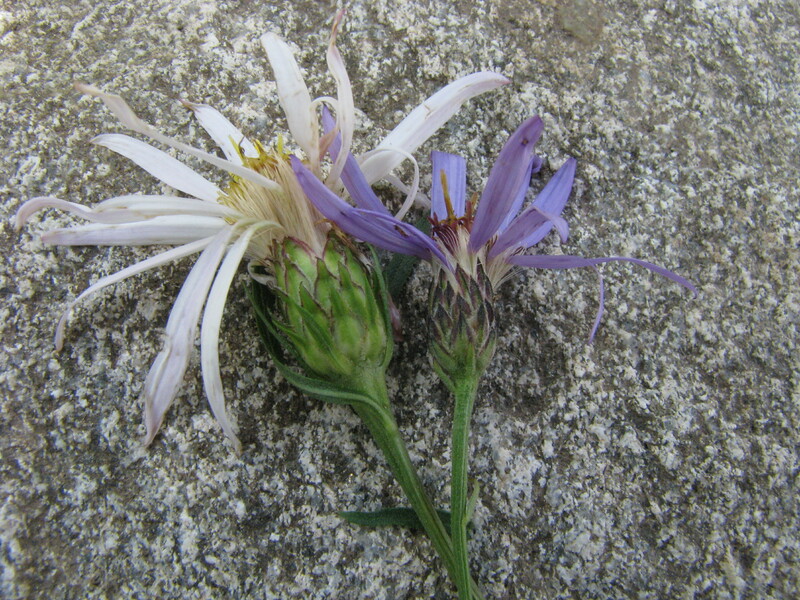 For comparison: Engelmann’s Aster left, Nuttall’s Aster right. 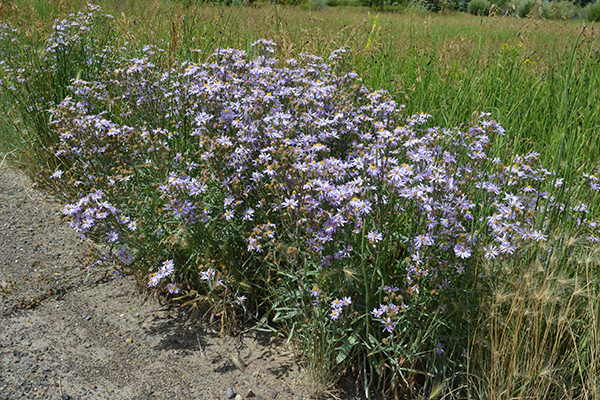 Blue-leaf Aster – Eucephalus glaucus – Look for colonies of 1-2’ stems covered with gray-blue leaves. The flowers are white to pale lavender and the bracts are pale, smooth, and thin-textured. The overall appearance is rather ghostly. It lurks in relatively dry and high, often sunny, locations. Blue-leaf Aster has a ghostly appearance on rocky high elevations. Pacific Aster is the most common aster: it tolerates a wide range of conditions and ranges greatly in height, but it always has lots of flowers! Pacific Aster – Symphyotrichum ascendens –One of the most common and tolerant asters, Pacific aster started blooming a few weeks ago and continues to do so along roadsides: from 6” where it may have been mowed or grazed, to 2+ feet where there is extra moisture. The light blue flower-heads grow along much of the stem. The bracts on the underside are shorter at the base and longer on the inside (ascending). The leaves are elongate and if you look closely, the venation is elongate too—these characteristics help us know it for sure. 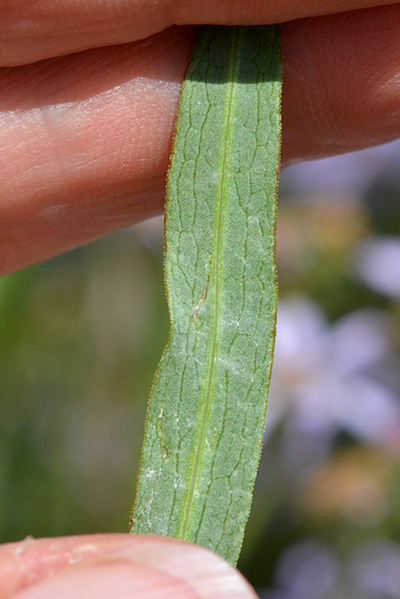 The leaf of Pacific Aster has elongate venation: a key to identification. 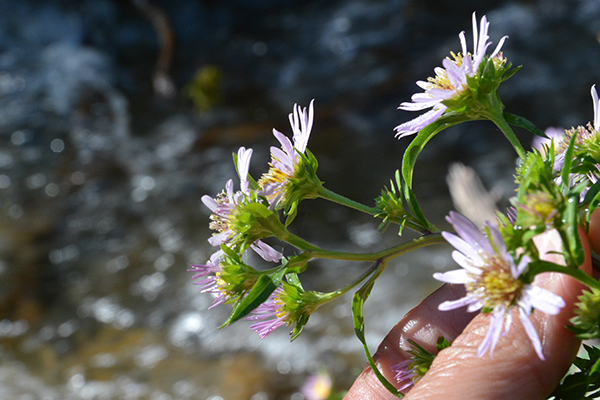 Another key to ID of Pacific Aster are the bracts: the lower ones are definitely shorter the the upper ones. Bracted Aster – Symphyotrichum eatonii – Found on stream edges with wet feet, this 2-4’ aster can at first be confused with Leafy Aster (below) as the blue flower heads have leafy bracts. However, the leaves of Bracted Aster are narrow and long ( >7x longer than wide), and the habitat is definitely wet. Flowers cover much of the plant and the stem is usually slightly hairy all over. 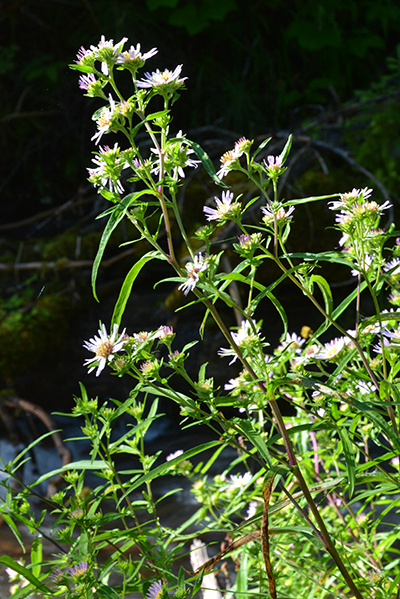 Bracted Aster is found along streamsides and wet meadows. Note the long leaves and many flowers along the stem. 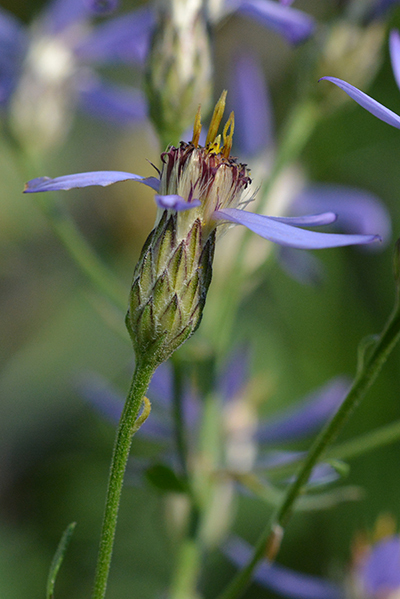 Bracted Aster also has leafy bracts, which can be confused with the species below: Leafy Aster. ID depends on several clues. 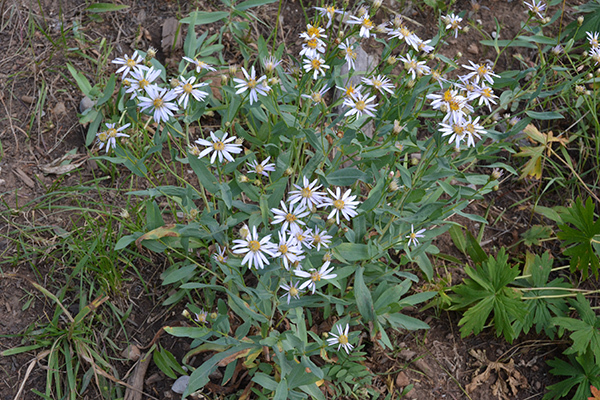 Leafy Aster – Symphyotrichum foliaceum – Just coming into bloom in moist meadows, near streams, and high elevations, this aster has broad oval leaves that often clasp the stem and several blue flower-heads with many ray flowers, which together create quite a show. Looking under the flower-head you can see the leaf-like bracts that give it its name. There are several varieties with different details of leaves, bracts, etc., but just “Leafy Aster” is fine. Leafy Aster usually has leaf-like bracts and long broad leaves. 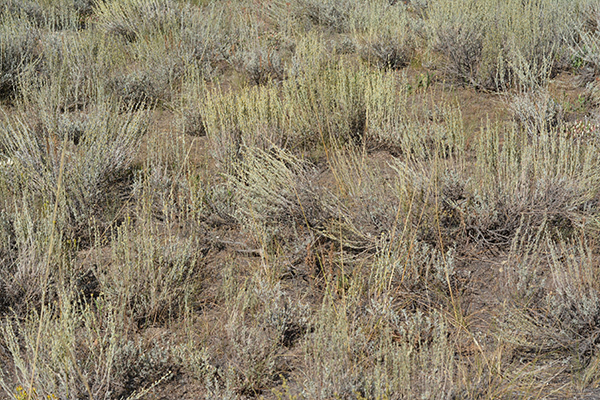 Sagebrush – Artemisia spp. – Many people don’t realize that our common sagebrushes are wind pollinated members of the Aster family: they don’t have showy flowers but rather produce pollen in tiny composite heads with no ray flowers and only a few disc flowers. This Low Sagebrush plant is in full bloom at Lupine Meadows. It is not showy as it is wind pollinated. Low Sagebrush – Artemisia arbuscula – A 1’ shrub that dominates Lupine Meadows in the park is now in bloom: 6-8” narrow stalks with tiny flower heads, each with about a dozen disc flowers, wave like wands and shed pollen to the wind—magic that any pollen meets a stigma surface to initiate seed formation. 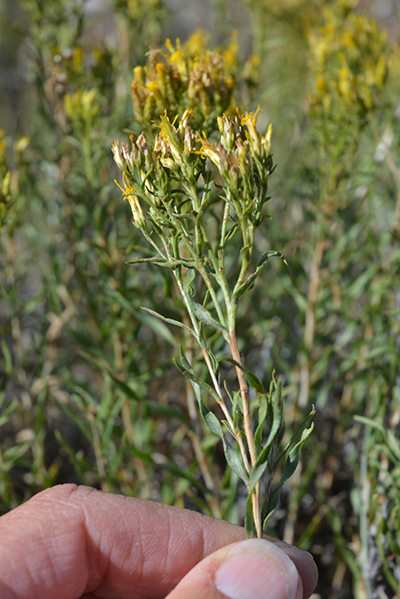 Its 1/4-1/2″ leaves have 3 lobes–like Big Sagebrush – held close to tough woody stems. 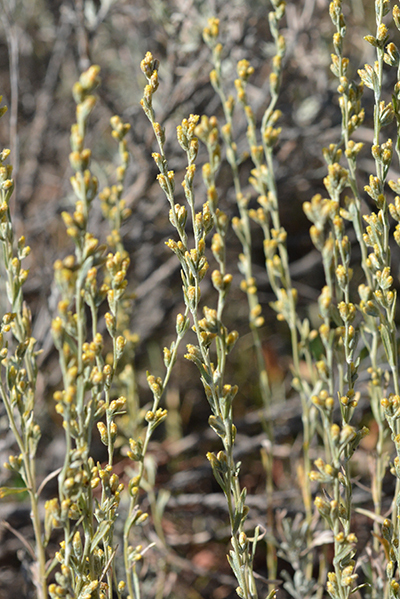 The composite flowers of Low Sagebrush are tiny. Soon our Mountain Big Sagebrush – Artimesia tridentata var. vaseyana — will wave about pollen too. 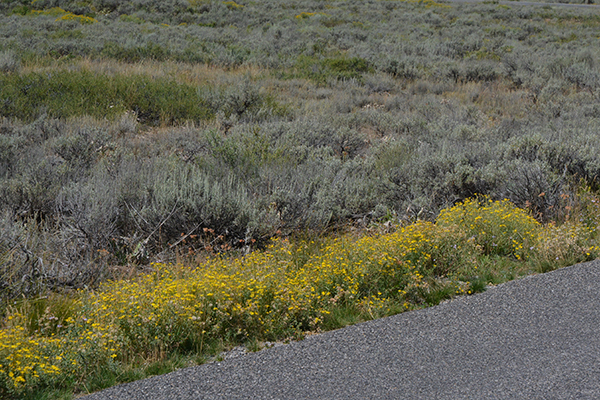 In full flower: Mountain Big Sagebrush. You can see the curved stigmas of the flowers, ready to catch the falling pollen. Naked Broomrape – Orobanche uniflora – Rare to find, this peculiar plant has no chlorophyll but rather depends on its roots to connect it to other living plants for food. Saxifrages, sunflowers, and goldenrods are often its “host” plants. This weird rare plant, Broomrape, does not have chlorophyll, it connects to other host plants for food. Mountain Bog Gentian –Gentiana calycosa. – These deep blue, 6-8” plants with egg-shaped, opposite leaves unfurl their pleated petals to attract late flying pollinators such as bumble bees. 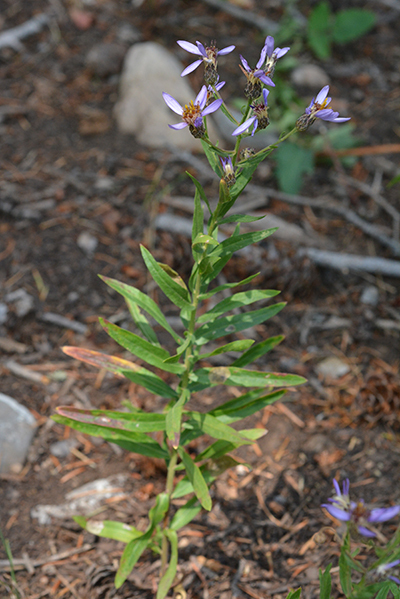 Look for it blooming at high elevations . 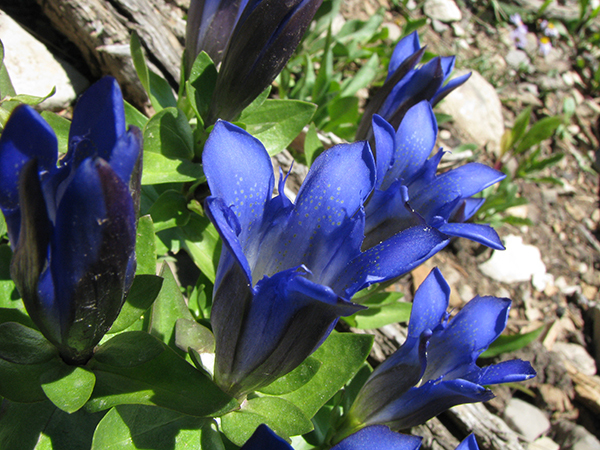 Mountain Bog Gentian graces high elevations with its unfurling, speckled, blue flowers. Quiz plant*: This is the flower of a tall plant that is considered the harbinger of autumn. It colonizes abundantly after ____, a behavior that gives it its name. Answer below. Enjoy hiking higher to see more showy blooms or looking closely with a hand lens at many wind pollinated plants. And don’t forget to look for fruits: berries, pods, capsules, etc. Fall is coming! 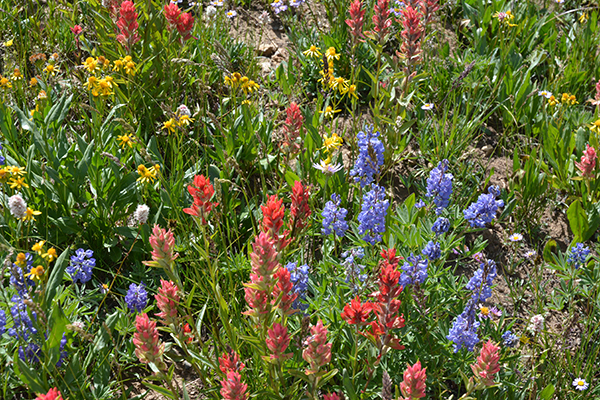 Lupines, groundsels, Indian paintbrush are now blooming over 9000′. 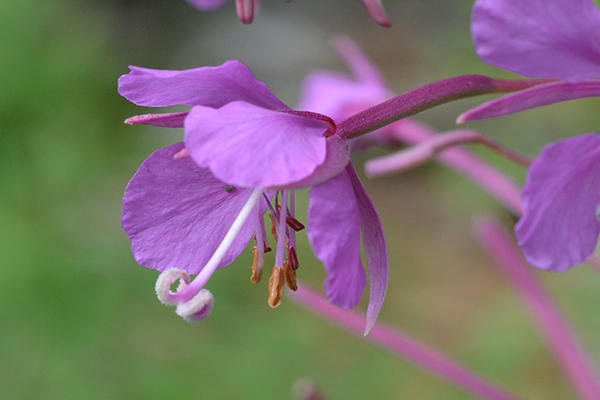 *Quiz answer: Fireweed – Chamerion/Epilobium angustifolium – The 8 anthers open sequentially releasing pollen. Pollen grains are linked by microscopic hairs which become entangled in the hairs of its bee pollinators. These same micro-strings attach readily to the 4-parted stigma which has little bumps. In each flower, the anthers develop first, then the 4-lobed stigma expands, to avoid self-pollination. The plants bloom from bottom to top. Those of us in the Wyoming Native Plant Society are interested not only in natives, but invasives, for they can be destructive, as we know. However, it seems that many people believe that any thistle is by definition a weed. Not so. 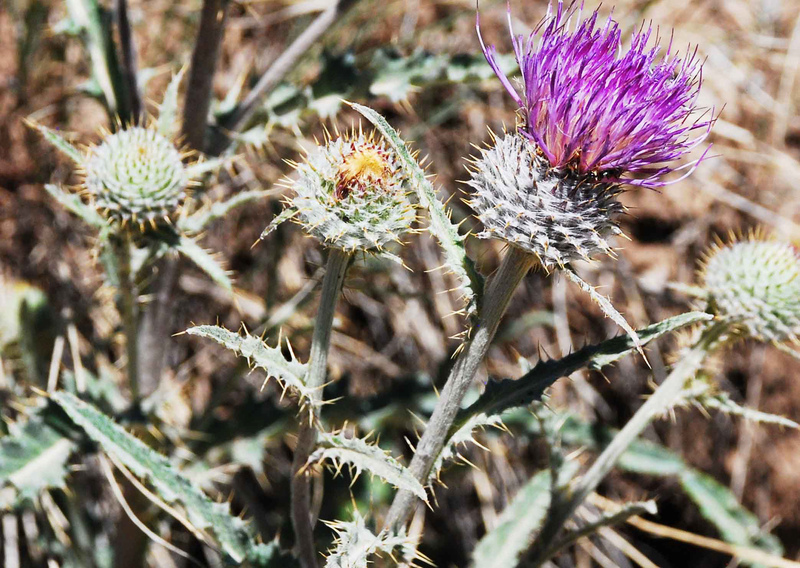 We have both native thistles and noxious weeds here, and this post intended to help everyone know the difference. 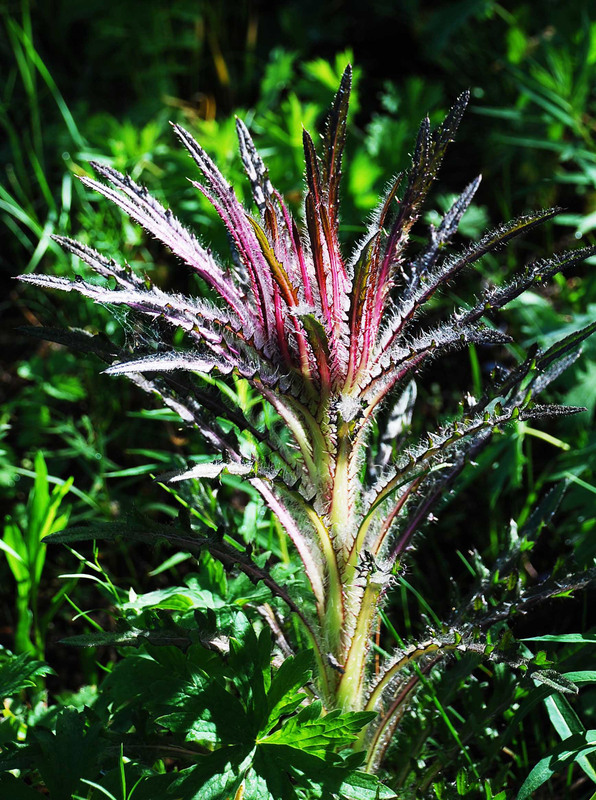 Plant keys and guides help identify thistles with technical details, but a broad-brush way to tell the so-called good from bad thistles involves things you can see immediately. All the species of native thistles are covered in white hairs that give them a gray or silvery appearance. Elk thistle (Cirsium scariosum) is distinguished by having a single leafy stem 3 feet tall and a cluster of pale flowers near the top. Elk thistle, Cirsium scariosum, showing growth habit of one main stem and flower cluster at top. Flowerhead of the elk thistle, Cirsium scariosum. Our other mid-elevation native species, Teton thistle (Cirsium subniveum), is also grayish in appearance, but it has branches coming off the main stem, each with one to several showy flowers that range from pale to a more intense violet. They are usually around 2-3 feet tall. If you look at the base of the leaves, especially at the lower part of the stem, they are strongly decurrent, as if pasted to the stem for as much as an inch. Teton (Jackson Hole) thistle, Cirsium subniveum. 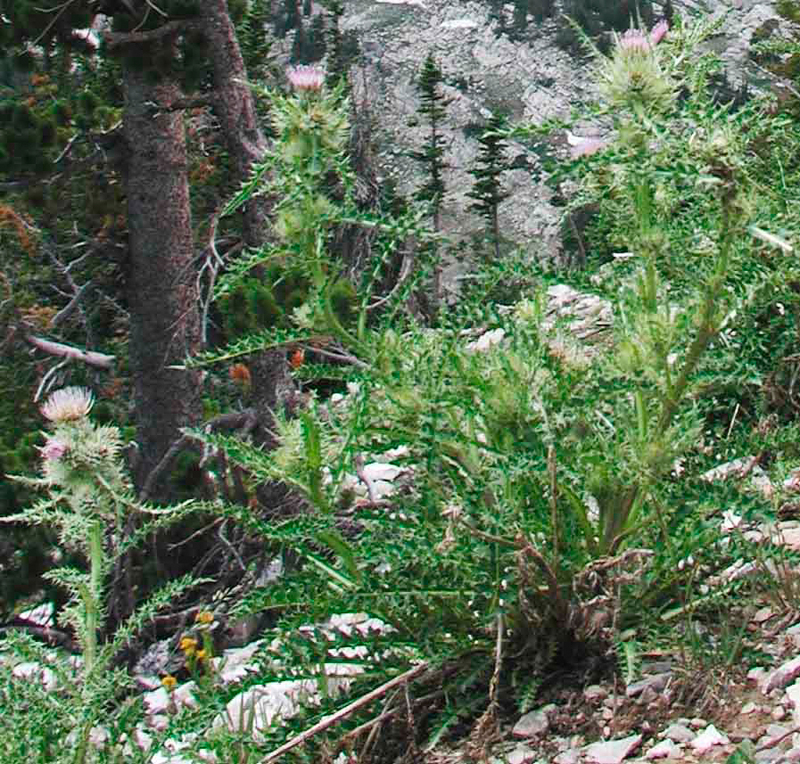 Tweedy’s thistle (Cirsium tweedyii or C. eatonii), an alpine species, is similar in appearance to Teton thistle, and also has branches and decurrent stem leaves, but is only seen above around 9,000 feet. Look for it above Tower 3 on the Rendezvous Mountain road. Tweedy’s thistle, Cirsium tweedyii or C. eatonii. 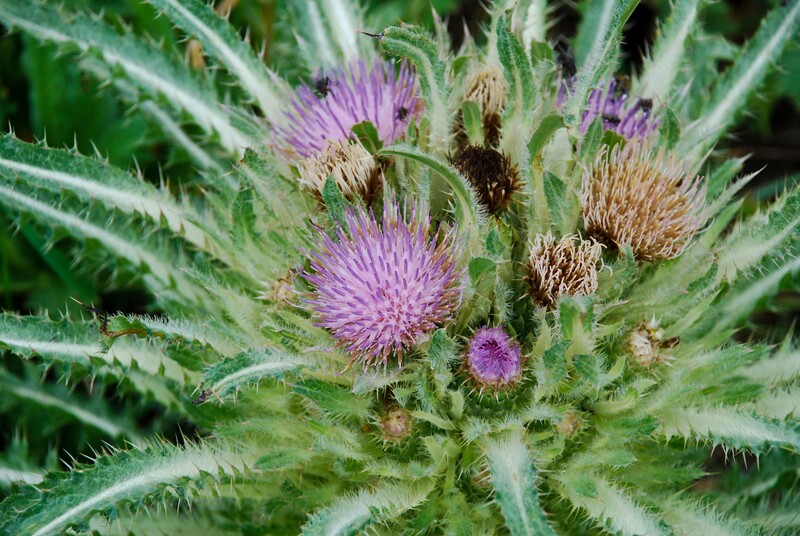 These native thistle species are found with other forbs and grasses and rarely dominate. 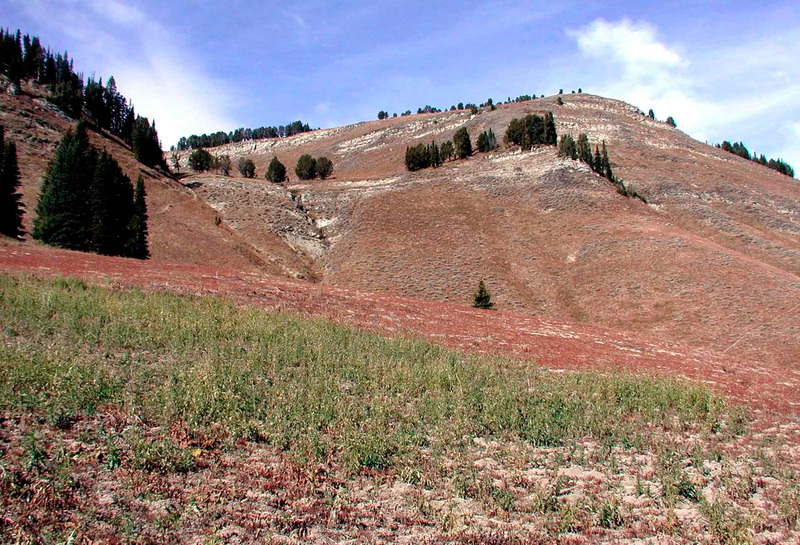 In newly disturbed sites, where their airborne seeds can take hold, they can be pioneer species, but as other plants colonize the disturbance, they take their place as an occasional plant among the wide variety of natives. 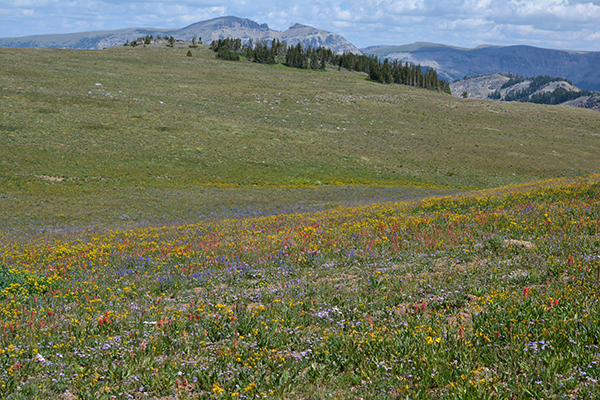 Deer and elk favor the young growth and flowers, and pollinators of all kinds visit the many disk flowers. Seeds are eaten by birds and small rodents. The most common non-native thistles do not appear gray or silvery. The plants have hairs, but they still look mostly dark green. 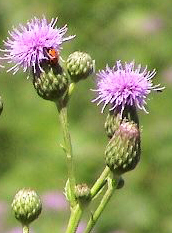 Canada thistle (Cirsium arvense) grows in clumps, has narrow stems and leaves, and clusters of small purple flowers. Usually found in moist places, it can reach 3 feet. This patch, in a recently vacated sheep grazing allotment, is the only green thing left after the sheep have left in fall. A few years later, mountain brome and bluebell are becoming lush and keeping the thistle contained. Canada thistle flowers, Cirsium arvense. Musk thistle (Carduus nutans) is the largest of the weeds, with flowering stems reaching 6 – 8 feet. It has a thick-leaved, robust base and a stout stem that branches near the top. Its deep-magenta flowers can be more than an inch wide. Bull thistle (Cirsium vulgare) is less widespread, and more silvery looking, than other weedy thistles. It is branching, kind of like Teton thistle, but the habit is more upright and it has stiff bristly stem leaves that are not decurrent. 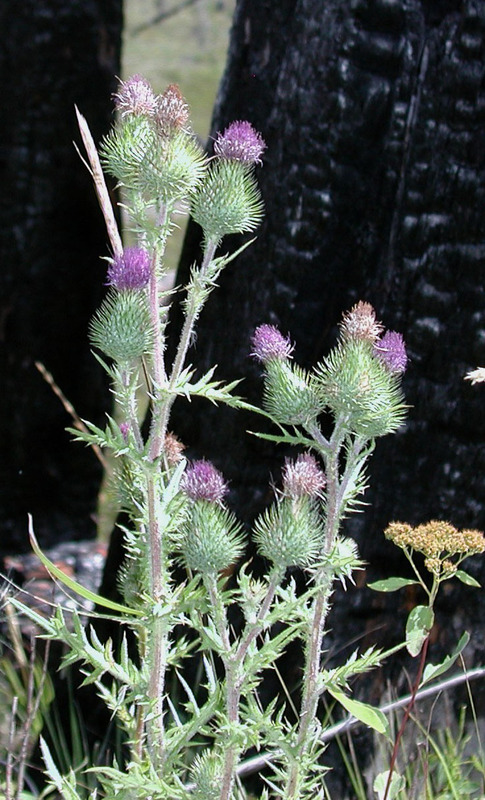 The calyx is tall and vase-shaped, whereas the calyx of the Teton thistle appears more rounded. 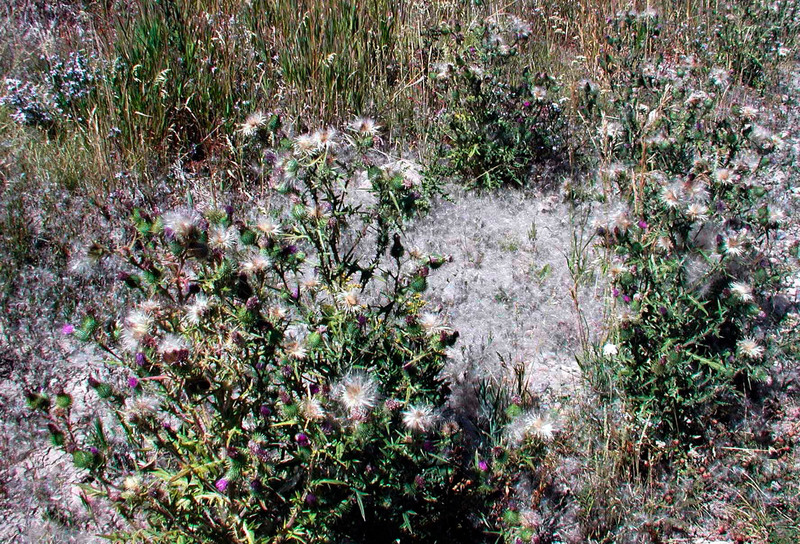 The photo below shows a patch of bull thistle gone to seed – an impressive number of parachute seeds that can take off in the wind and colonize disturbed areas deep into the backcountry. Bull thistle, Cirsium vulgare, gone to seed. 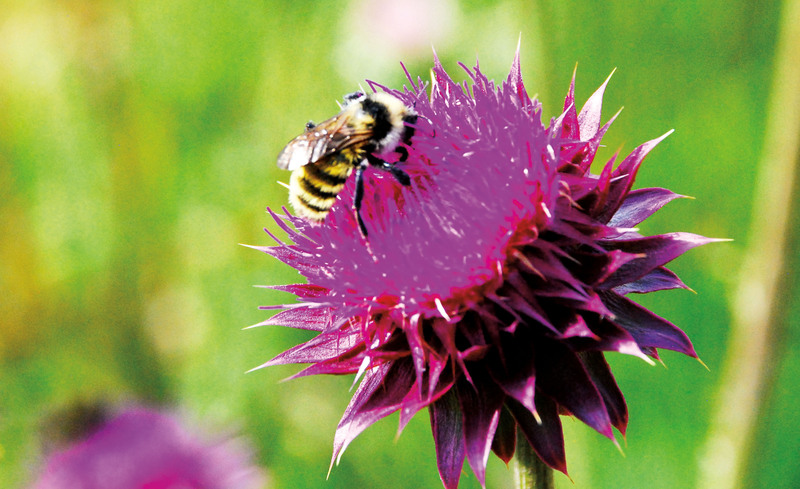 • Let Teton County Weed and Pest know if you find an infestation, especially of musk thistle. UTM (GPS) coordinates nice to have if in the backcountry. Weed and Pest will send crews to spray if needed. • If you see someone pulling native thistles, let them know these aren’t weeds. • Do pull musk thistle if so inclined (thick gloves recommended!). They have tap roots so they can be pulled. However, if they are in bloom it does no good to leave them lying there. The blooms will mature and go to seed. Before they bloom they can be pulled and left. • Don’t pull thistles unless you’re sure of the identity. • Don’t try to pull Canada thistle. It has underground rhizomes and cutting them will only stimulate growth. TC Weed and Pest (www.tcweed.org) is a good resource for identifying weeds, thistles or otherwise.